Electric vehicles have been in operation as public transport modes in the Philippines since 2007 when electric three-wheelers were introduced at the Bonifacio Global City in Taguig City, Metro Manila. At the time, the City Government of Taguig bought the pitch by the proponents of the E-Trike and supported their trial operations that have since expanded but are yet to be legitimized due to the vehicles not being registered with the Land Transport Office. These could not “legally” charge their passengers since they also did not have franchises with the Land Transport Franchising and Regulatory Board (LTFRB) nor with the local government (i.e., like conventional tricycles). Meanwhile, around the same time, another electric vehicle was introduced in the Visayas. In this case the vehicle was in the form of a national icon – the jeepney. Electric jeepneys were first built out of China and directly imported as a “proof of concept.” What were initially launched in Bacolod and Silay Cities in Negros Occidental were examined by local partners based in Manila, and eventually a locally manufactured E-jeepney came out in 2009, care of the Motor Vehicle Parts Manufacturers Association of the Philippines (MVPMAP) and Motolite with assistance from the Dutch Stichting Doen. The project quickly gained proponents including two very influential mayors and their cities – Binay of Makati and Hagedorn of Puerto Princesa. 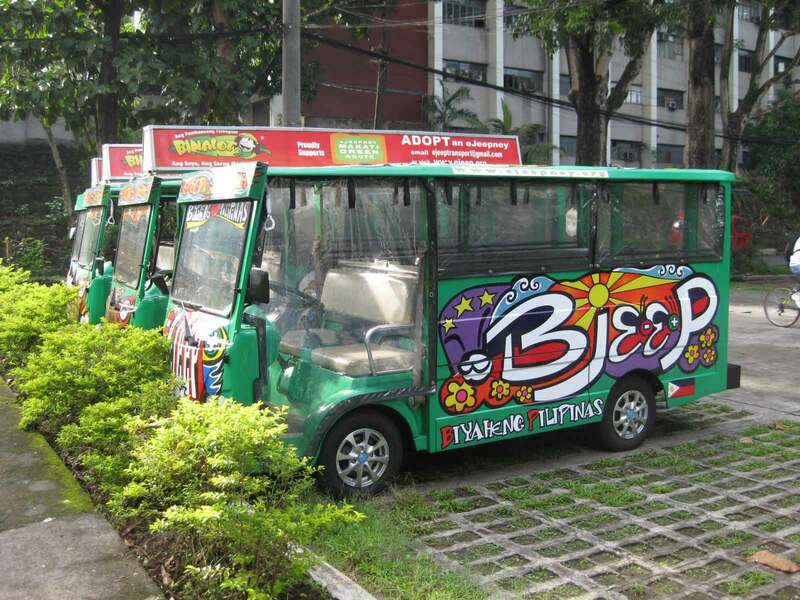 It is to the credit of the cooperation between the Institute for Climate and Sustainable Cities (iCSC, the original proponents of the E-jeepney) and Makati City that there are currently two E-jeepney lines in that city. But while the vehicles have been registered with the LTO (using the conspicuous orange plates), they have yet to be granted franchises by the LTFRB. The vehicle gained more attention when the newly elected Vice President Binay rode the vehicle to the inauguration. Currently, the E-jeepney is subject to studies at the National Center for Transportation Studies of the University of the Philippines and has gained interest from private firms as well as other researchers. Together, the E-jeepney and the E-trike represent the strongest cases for electric vehicle applications in public transport. The Asian Development Bank is offering as much as $280 million in loans for the Philippine government to finance a proposed re-fleeting program for tricycle drivers and operators shifting to electric motorbikes or e-bikes. “The loan will be coursed through ADB conduit banks like Land Bank of the Philippines for re-lending to tricycle drivers who may want to shift into using e-bikes,” Environment Secretary Ramon Jesus Paje told reporters in a briefing Tuesday. He said ADB will give 30 e-bikes as donation to city governments in the Metropolis. “ADB wants to us to sample the bikes to see for ourselves that these machines are totally pollution-free. No emissions, less pollution,” he said. If all Philippine tricycles are e-bikes, the country can save much as 20 million metric tons of carbon footprints a year. “We could go into carbon trading. That will earn us dollar equivalent which we can use to offset a portion of the loan,” said Paje. Tricycle drivers can save up to P300 in daily fuel costs with the use of e-bikes. “Four hours of charging would only cost P40 compared to P340 for fossil-based fuels. The acquisition cost is about 20 to 30 percent higher than fuel-fired motorcycles but the overhead cost is certainly lower,” Paje said. 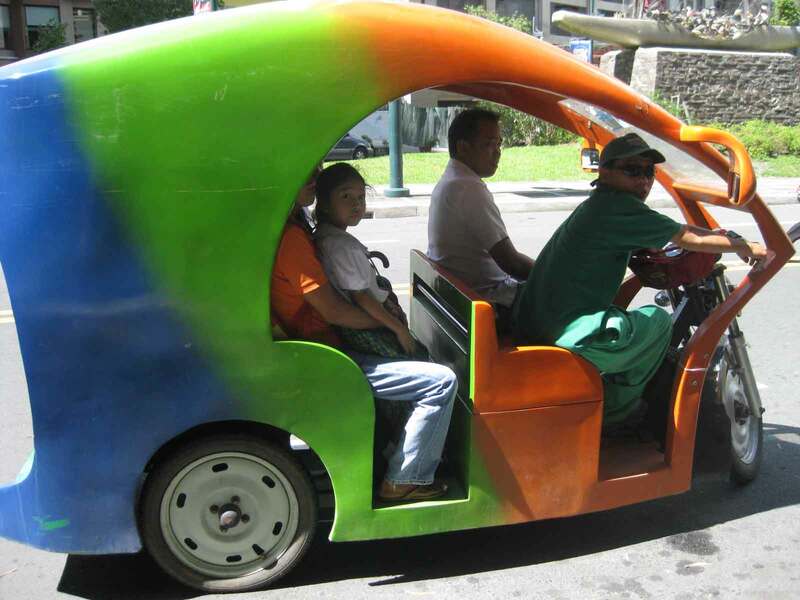 Of the total 5 million tricycles in the country, 2.8 million are in Manila. The department said that the shift to e-bikes would reduce pollution 25 percent to 30 percent in the country’s urban centers by 2011. As of 2009, the country’s total suspended particulates – a concentration of micro pollutants in the air – in all cities and urban centers is 134 micrograms per normal cubic meters, which is 48 percent beyond the normal standard of 90 micrograms per normal cubic meters. The major sources of these particulates are diesel vehicles and coal-burning power plants. Dust from unpaved roads and construction activities contribute to the rise in particulates especially during summer months. Vehicles contribute as much as 80 percent to air pollution, while the remaining 20 percent are from industries. Department monitoring shows that more than 50 percent of vehicles are registered without prior actual testing by accredited Private Emission Testing Centers. The ADB initiative comes at a critical time when the national government is still finding its way with regards to local public transport modes, particularly how the tricycle has established itself as the primary (sometimes, the only) public transport option in cities and municipalities across the country. It is inevitable that the issue of proliferation and regulation of tricycles will have to be addressed. National and local government would have to discuss the nuances of the Local Government Code in as far as public transport operations, franchising and fare setting are concerned. On top of this, the time is critical also because there is a strong call for environmental sustainability; one that is anchored on the increasing awareness for climate change and its impacts. The long-standing perception is that the conventional tricycles contribute to the continuing degradation of our environment as the collective emissions from these vehicles effectively suffocate our cities, and the key is for local governments to realize this and be a major player in transforming local transport into the environment-friendly kind. It is, after all, in the best interests of their constituents that clean air be pursued to ensure that there will be a bright future for their cities and this country. By d0ctrine in Electric Vehicles, EST, Jeepney, Paratransit, Public Transport on August 25, 2010 .
the initial draw of e-vehicles to commuters is the novelty. but anyone who rides an e-vehicle will instantly appreciate the fact that one can breathe fresh air rather than carbon monoxide fumes. the e-jeep is also uncannily quiet. in UP, this means you can listen to the chirping of birds rather than the loud whirring of gas-powered engines. however, e-vehicles should be rigorously tested and maintained to ensure the safety of passengers and other motorists. an e-trike driver in the Bonifacio Global City told us recently that a number of e-trikes had broken down. i wonder where those were manufactured? sounds like a golden opportunity for the Philippine jeepney manufacturing industry to shift to environment-friendly vehicles!